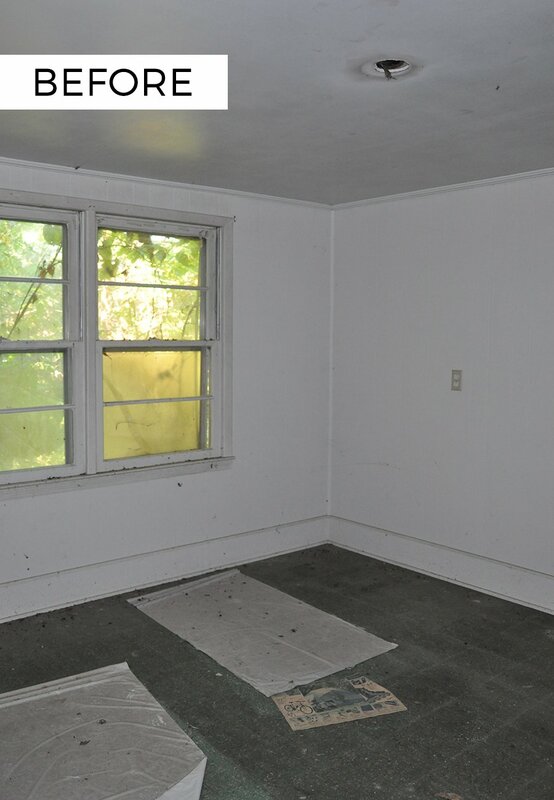 If you are just now tuning in, the husband and I bought an abandoned 1930 bungalow. We’ve spent the past eleven (has it really been nearly a year?!) months working hard to once gain make it resemble a house. To catch up on our progress so far, feel free to browse all Bungalow Renovation posts. I’m starting to think that these home renovation progress reports are more therapeutic than, say, real therapy. Although, on second thought, I’ve never been to therapy, so I can’t be too sure. You’re probably incredibly confused by that statement, so allow me to explain. I have noticed that no matter what topic I start with, I always, always end up lamenting about my OCD and how incredibly difficult it is to renovate an old house when your obsessive compulsive tendencies are driving you to TEAR IT ALL DOWN and start from scratch. Anyway, I won’t bore you with the details of my emotional well-being or lack thereof; let’s talk about an equally riveting topic, instead: hardwood floors! You saw a quick preview last week (Or was it the week before that? 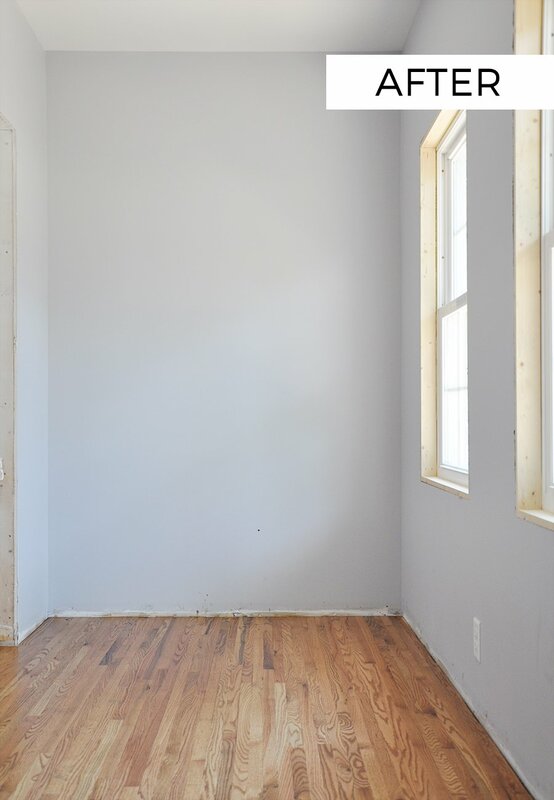 Who’s keeping track…) in a post where I shared a few tips on what to expect when refinishing floors, but now it’s time to look at each and every room and marvel at the transformation thus far! First up is the mud room. Guys, it gets worse – much worse. But while we’re in the mudroom, let’s look at how it turned out. For anyone who’s curious about the layout modifications, we ended up converting the long and narrow sunroom in the front of the house into several functional areas, the first of which was this mudroom. Within the room itself, we built a large closet along the left wall and closed in one of the windows so we could install floor-to-ceiling shelving or possibly place a funky dresser with a mirror to store things like gloves, hats, scarves and other random odds and ends. The biggest modification we did in the living room was tear down the wall between it and the master bedroom directly to the right. 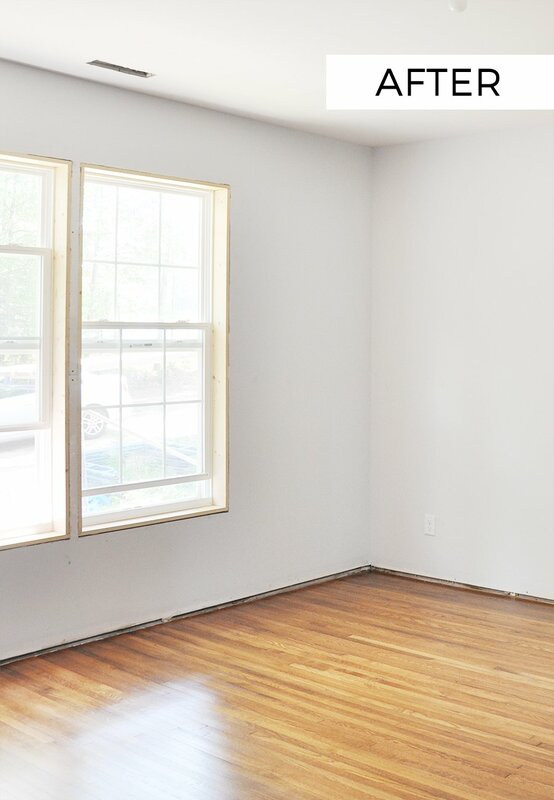 Now we have a nice, open space – perfect for entertaining or hosting sock races. We also added a second window (why didn’t we add a third?!) to allow more natural light to enter the room, because dark and gloomy places make me depressed. 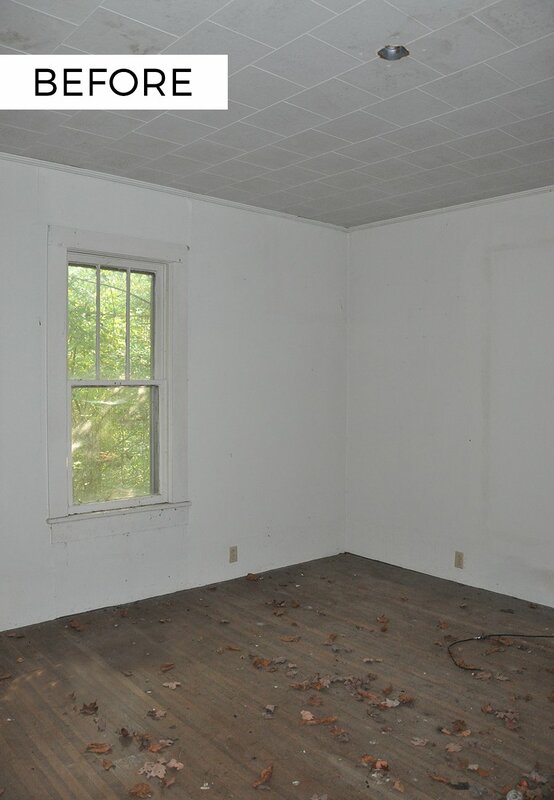 Here’s another look at the living room and the natural light that now streams from the two windows. Once we move in, I’m plan to assemble a post on my biggest design regrets – and you can be sure the lack of a third window will be at the top of that list. 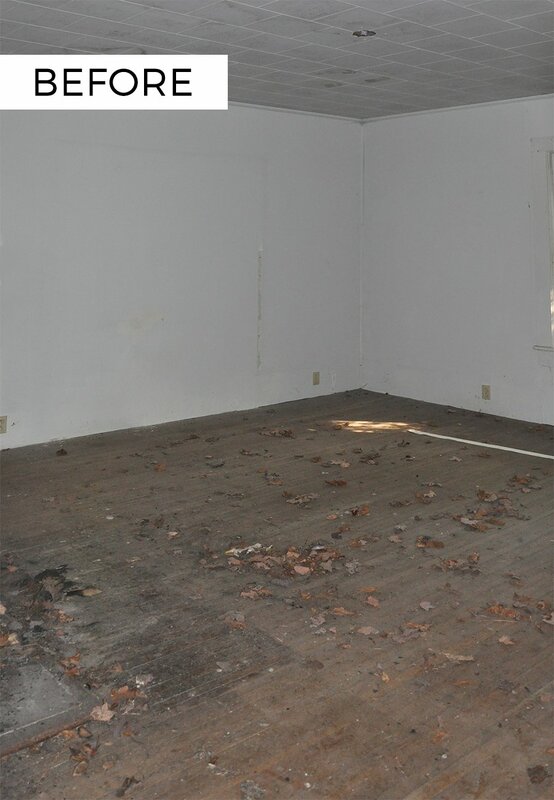 But for now, let’s concentrate on the positives, like the new (old) hardwood floors and all that natural light. 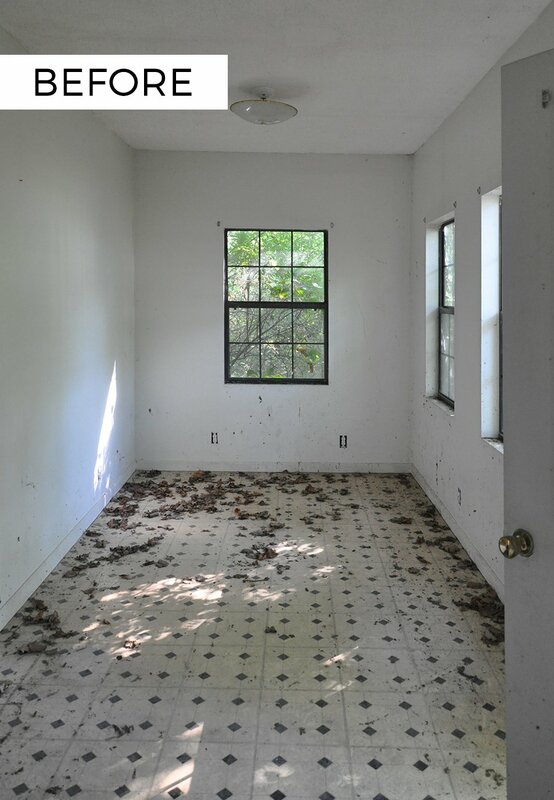 Unfortunately I couldn’t find a good “BEFORE” photo of the dining room (which used to be the master bedroom), because I’m an idiot and instead of sorting renovation progress photos as I took them, I am now stuck with thousands and thousands of photos in one folder with no rhyme or reason. 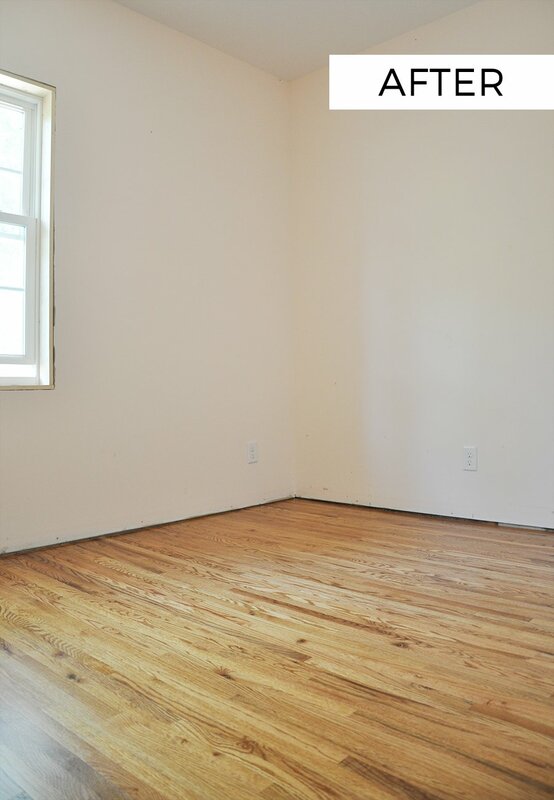 But if you saw last week’s preview post of the floors, then you should have an idea of what the space looks like now. Down the hall to the right we have the master bedroom – quite possibly one of THE nastiest “BEFORE” photos you’ve seen, no? I had to look long and hard before I could figure out what I was looking at. But it gets better, friends. 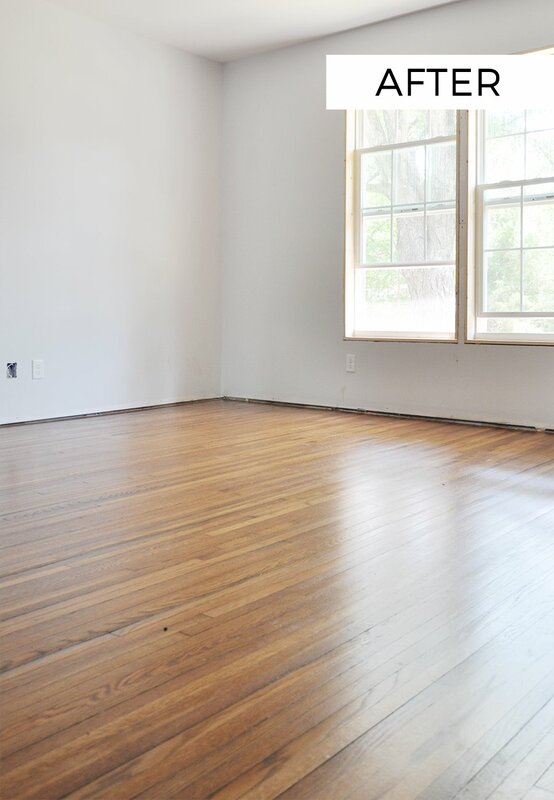 Just look at those nice and refinished hardwood floors from 1930s! Or that fresh coat of blue (but was supposed to be gray) paint! Or the kitchen cabinets hiding in the master bathroom (whaaaat?)! Needless to say, there’s still a lot of work left to be done. Across from the master bedroom used to be a large, awkwardly squared hallway that lead to what is quite possibly the most disgusting bathroom to ever appear on the Internet. Not to worry, though. 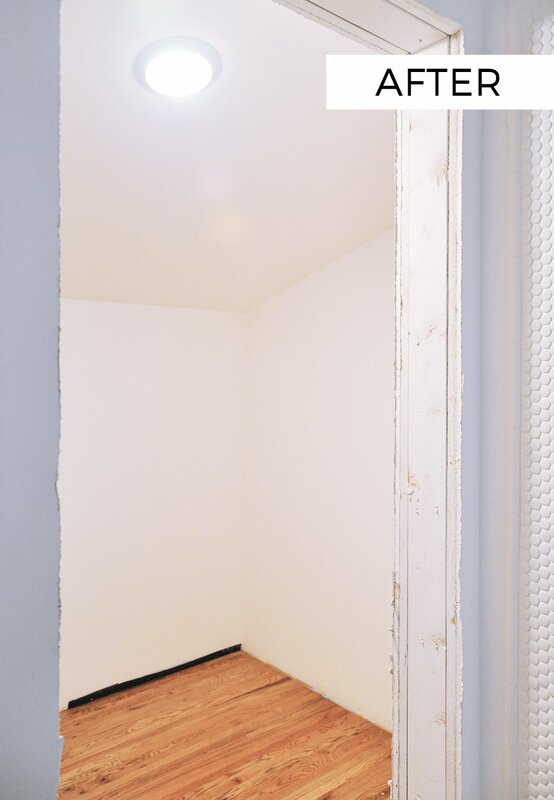 This space has since been transformed into a guest bath, hallway closet and – wait for it – my office (or possibly a second guest bedroom)! Craziness, right? Speaking of guest bedrooms, right down the hall used to be the dining room, which we converted into a guest bedroom. 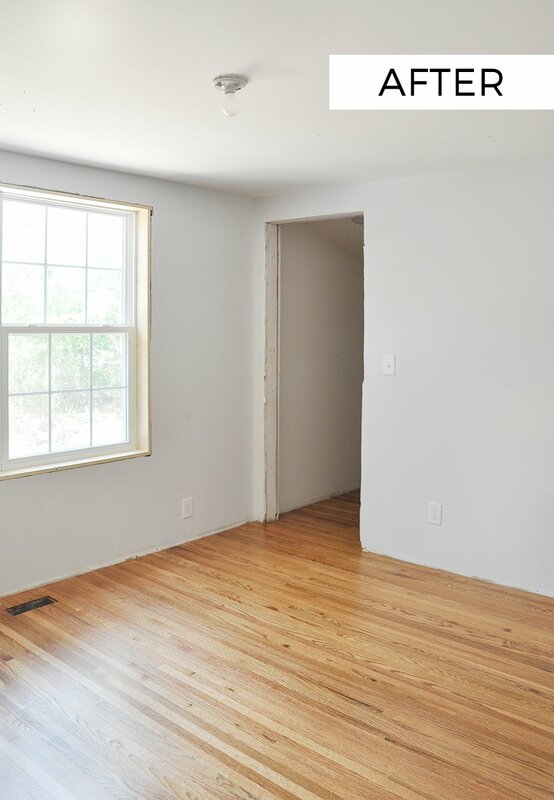 Pretty jealous of our future guests; just look at all that natural light in the space! Also, that doorway you see to the right is a nice walk-in closet. Guest bedroom goals, amIright? And speaking of closets (look at me making all these smooth transitions, ha! ), what used to be the laundry room is now our master closet. Here it is in all of its “BEFORE” glory. And voilà! A much improved space that will one day (hopefully soon) house all my clothes – half of which, by the way, I’m going to be selling at a gigantic yard sale, so if you live in the Cleveland/Chattanooga area, be on the lookout for more details (if you need clothes, furniture, etc., that is!). And that, ladies and gentlemen, concludes today’s little tour. What did you think? Isn’t the transformation TOTALLY CRAZY? I’ll be back oh-so-soon with more updates from the magical world of bungalow renovations, and in the meantime, please keep your fingers (and toes) crossed for us to make lots of progress over the next few weeks so we can (hopefully) move in some time in July. 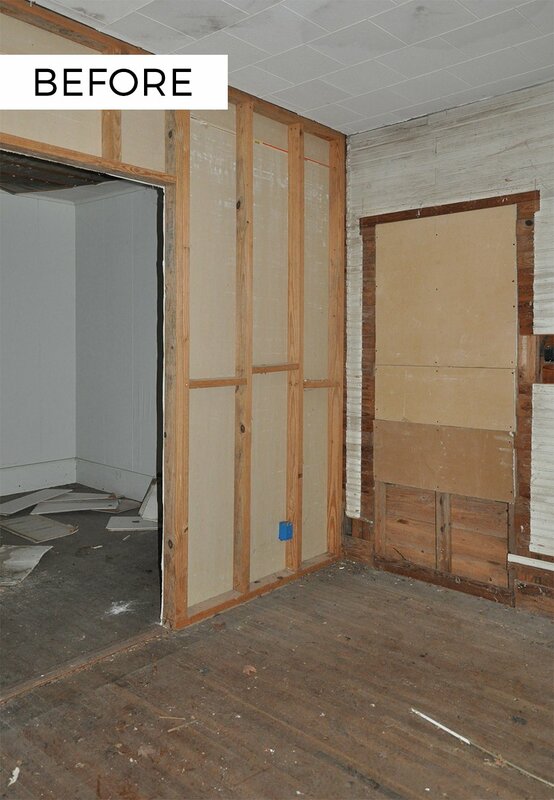 To catch up on what we’ve renovated so far, you can browse “Our Bungalow Renovation” series. 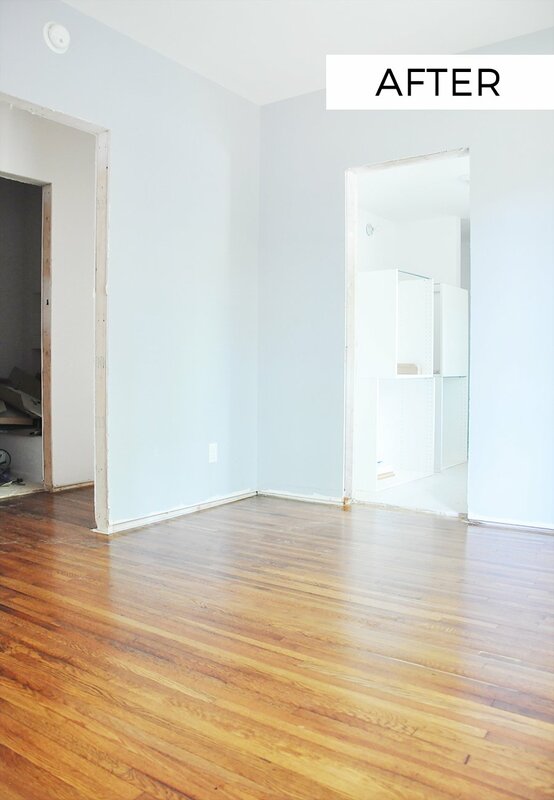 Posted in HOME DECOR, OUR BUNGALOW RENOVATION and tagged HARDWOOD FLOORS. Love seeing your before and afters. Your house transformation is coming along great!! It’s looking great! I love that wood shade nice choice! Love how everything is so bright. I can really see everything coming together! The new floors look beautiful! It is really coming together! Looks like a lot of work, but the results are gorgeous! Wow! What a huge difference in before and after pics. You guys are doing an awesome job! Wow this looks amazing! I love the all white too! Thats a hard tasks but it is such a good feeling when it is finally accomplished! They look amazing! 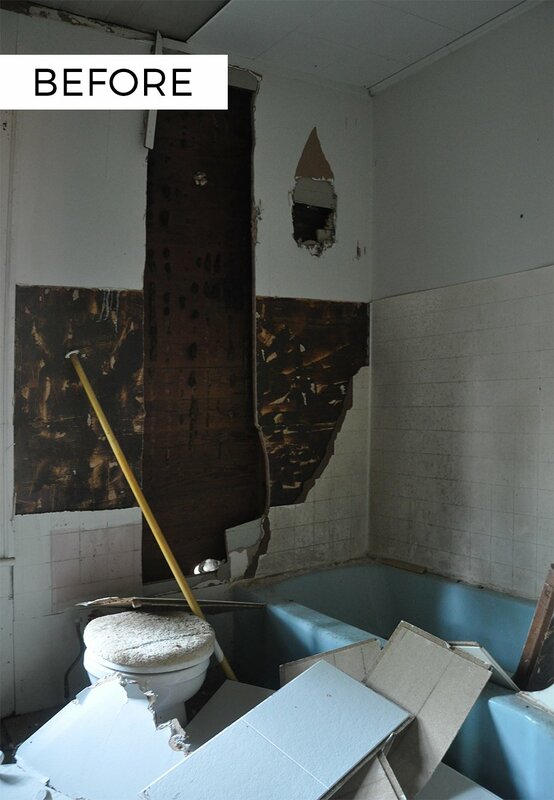 We are about to reno our master bath! I love working on a house and turning it into a home. Can’t wait to see the finished results! It looks like a completely different place! I cannot wait to see the finalized place. Wow these transformations are insane! I love seeing what progress you have made. I can totally relate to the OCD and wanting to tear the whole thing down, that is how I would be too. I cant wait to see future progress! Happy weekend! Wow it’s amazing the difference that new floors can make! Thanks, Tori! 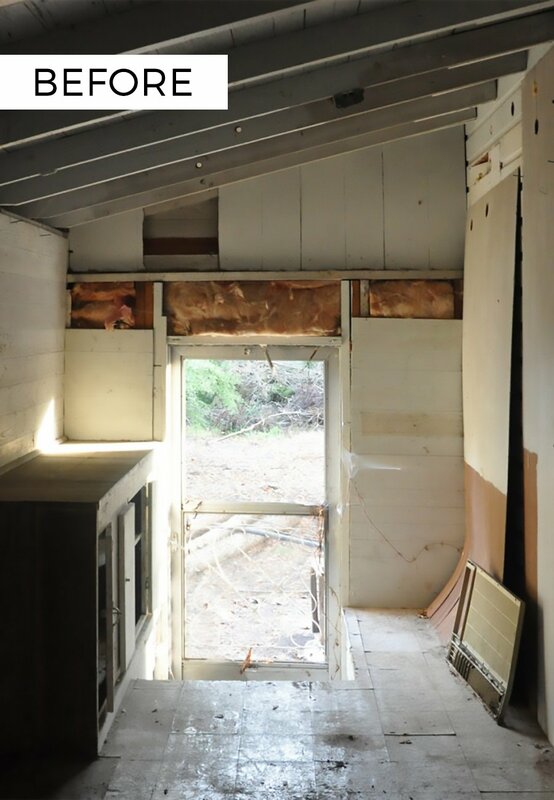 I wish I could say it was just the floors – we gutted the entire thing and re-built it from the ground up, so a whole lotta work went into it before the floors. But you’re right, once the original floors were re-finished and the new ones installed, the difference in the space was MAJOR!